Pullman Bar & Diner hearkens back to the roots of a train diner, paying homage and celebrating craftsmanship and industriousness in America. The food is their take on classic Midwest diner fare. It’s a chef-driven menu with an emphasis on local sourcing and a dedication to quality. Pullman contacted Creative Mellen to take this brand and represent its ambiance online. 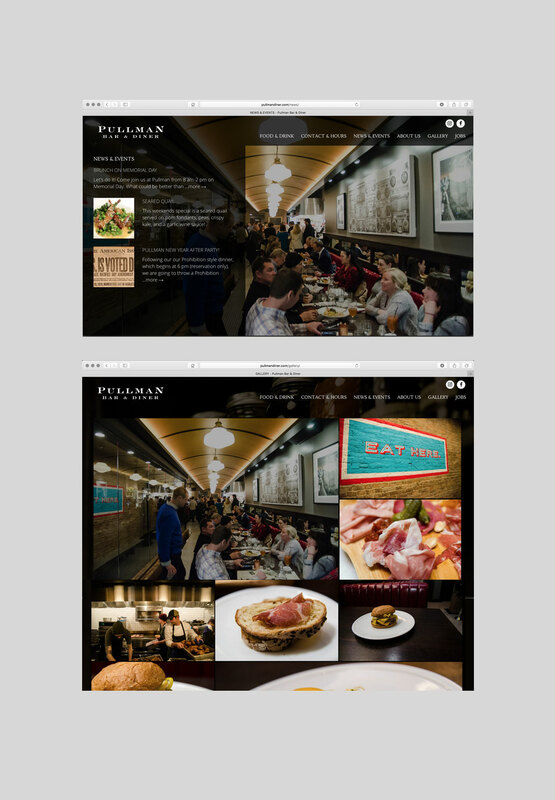 Pullman challenged us to create a simple but informative online experience that matched the feeling of the diner. The diner’s interior is a classic 1940’s locomotive diner car with full bar and open kitchen. Because it is such a visual space, we decided to represent it online with beautiful photography. We used professional photos of the space, the interactions of both customers and chefs, and the food as the website’s foundation. We developed full-frame imagery with overlay sidebar information to give a sense of space. We incorporated the actual printed menus online for easy staff updates. An image gallery also enhances the visual appeal that makes the diner so unique. Other elements such as a blog and social feeds, newsletter signup, and quick access phone/hours on desktop and mobile allow for a great user experience. All these elements highlight the quality and atmosphere of this premier diner.